When it was announced last year that Rush was returning to the concept album format, it immediately created an excitement and anticipation of such proportions that it made you wonder if the band could actually deliver on such a lofty expectation. After all, the concept era for Rush includes such classics as 2112 and Hemispheres – weighty company indeed. And although Rush’s last few releases were indeed good, they were not great, so this time around status quo would not cut it—it was time for something special, and the band has delivered its finest album since Presto. The story of Clockwork Angels is classic Neil Peart: a tale based in some sort of existential crisis, in a futuristic world called the majestic Crown City with a character named the Watchmaker presiding over all things. I will leave the rest to you dear reader to interpret (it is quite deep) but you get the gist! Far from a forced attempt to rekindle the magic of yesteryear, this release contains freshness in the band’s songwriting and lyrical themes, the likes we haven’t seen since at least the early 1980s. The depth is not just limited to lyrics and storytelling. The songs themselves contain a level of complexity that will demand your attention far past an initial first listening—there is a LOT going on here! In fact, my first listen left me quite bewildered, but further listening allowed it all to sink in, make sense, and take hold. With that said, perhaps it’s a good thing that Rush decided to open the album with two tracks already familiar to us. Released in 2011, “Caravan” and “BU2B” ease us in gently (as gently as possible for such heavy tunes). These tracks feature a heavier and edgier Rush sound, and now feature some additional production and sweetening which make them superior in every way to their pre-release counterparts. “Epic and Majestic” are not adjectives I have used to describe Rush songs across their last few albums, but those words are more than fitting when used to describe the album’s seven-minute title track. Featuring everything from pounding riffs, a classic Geddy vocal, and even a strange and trippy interlude acoustic section, the track takes you on a journey leaving you exhausted yet still asking for more. To my ears, Geddy’s vocals on 2007’s Snakes and Arrows sounded perfunctory, listless, and unnecessarily buried in overdubbed harmonies. On this release he has clearly gone out of his way to rectify that, not only singing in a higher key but exhibiting an ability to emote the lyrics to great effect. Just listen to how he sings the words, “Higher still against the night” in the title track. It’s been a long time since the man’s voice has sent shivers down my spine. The album’s first single “Headlong Flight” is a virtual tour de force of all the ingredients that make a great Rush song, and one of many opportunities to apply the phrase “return to form.” This is quite frankly the Rush song you have been waiting for since the early 1980s. Clocking in again at over seven minutes, the song contains moments reminiscent of “Bastille Day” as well as a short, unaccompanied drum break and, wait for it… a balls to the wall “Working Man”-style guitar solo from Alex! After years of “texturing” the man finally returns to that pleasing style and provides proof-positive that his “ALD” is in full remission (Don’t know what that is? Google it!). “The Anarchist” once again brings the bombast with Geddy’s bass thumping along and an occasional nod to Middle Eastern tonalities. “Carnies” features a guitar riff that would not have sounded out of place on Fly By Night or Caress of Steel, and “The Wreckers” with its jangly guitar intro, sounds every bit like a Presto tune minus the keyboards. “Seven Cities of Gold” once again returns to that epic and majestic sound and gives the title track a run for its money as my personal favorite song on the album. As ambitious as these songs are, they still manage to maintain an air of accessibility. “The Wreckers” is perhaps the simplest and catchiest track on the album with a deceptively intricate guitar part and inflective and poignant lyrics. “Wish Them Well” features a super-catchy chorus and would not have sounded out of place on 1996’s Test For Echo, while “Halo Effect” and “The Garden” are simply gorgeous sounding. If there is one complaint (it’s always something, isn’t it? ), it’s in regards to the album’s fidelity. Nick Raskulinecz is a great producer, but if one takes a look at a short list of his credits (Foo Fighters, Trivium, Evanescence) it’s not a stretch to assume the band chose him to attain a more modern sound. This is unfortunate as I find the overall sound of the album to be a bit cluttered and noisy and to add insult to injury; the CD is mastered quite loud and is not as dynamic as it should be. By way of comparison, the 180 Gram Audiophile vinyl sounds stunning, with totally different mastering, and full dynamics in place. Neil’s snare drum in particular has a pleasing “snap” and it’s much easier to hear just who is playing what. It’s hard to believe Rush is about to enter its fortieth year of existence and remarkably, Clockwork Angels never sounds dated nor comes off as a half-baked retread. This is easily the trio’s most compelling and solid collection of songs in years, and provides a much-needed fix for the fan that has yearned for the band to once again explore its progressive side. Depending on which track you check out first, you’re likely to think that Push Method is a band in one particular genre, and then you’d be completely wrong by the time the next track came on. But despite variety that combines elements of hip-hop and electronic pop with classic rock, funk, and classical, there’s something coherent that ties the package together quite nicely. Given our typical taste for more polished rock-oriented material, we were surprised just how much we enjoy Scars & Stripes. Months after receiving it, the music is still getting regular plays in our studio, and for good reason: New Yorkers Michael Dustin Youree and Tavis Sage Eaton are great songwriters and musicians with backgrounds in both the NY music and theater scenes. The vocal delivery keeps things cooking on Scars & Stripes, sounding like Beasty Boys one moment, Kid Rock the next, and Freddie Mercury at the next musical shift. Likewise, one minute you’ll hear a song with a Red Hot Chili Peppers bass groove, the next track will sound like classic ‘80s hip hop, and then you’ll hear a beautiful, piano-driven ballad (“I’ll Stay”) that Push Method wisely doesn’t mess with in the production department. And that’s another big part of the strength here. On this self-produced album, they applied the right style of production for each song, yet still managed to make it sound like it’s all coming from one musical well. Musicians who grew up on ‘80s rock and pop may recall the artist who kept coming to our mind when listening to these guys: the Dan Reed Network, also a New York band who embraced a variety of pop and rock styles, musically and vocally, to create their unique, signature sound. Tracks like “Am I Able” really channeled DNR! A favorite track or two? It’s hard to say. We love the piano-driven rock stuff like “Morph” and the powerful ballad, “Blood in the Water,” that sounds like Queen meets Five For Fighting with Kid Rock jumping in for some guest vocals. But we also really came to embrace the hip-hop sounds. Really, not a bad move in this collection. It’s unique, crosses genres with flair, and is sure to provide musical inspiration for players too rigidly stuck in their favorite styles. A visual smorgasbord for Queen fans featuring some exclusive photocopies of handwritten lyrics. Queen: The Complete Illustrated Lyrics is a laboriously compiled and pretty spectacular book containing the words to all 161 Queen songs, accompanied by brilliant photographs and artwork spanning various eras of the band’s career. A decent chunk of the lyrics printed here—from hits that have reverberated throughout the public consciousness for decades to deep album cuts beloved by super fans—are actually photocopied from handwritten drafts done on ripped-out notebook pages, hotel notepaper, post-it notes, etc. Also featured are a number of captioned anecdotes about these relics, some of which were rescued from the shredder among other old papers. 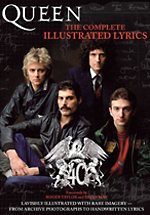 At roughly 400 pages, The Complete Illustrated Lyrics allots ample attention to everyone in the group, presenting scribblings and vivid images of Freddie Mercury, Brian May, Roger Taylor, and John Deacon, offstage and on, together and separately. Fans who grew up with only record jackets and CD booklets to look at will be engrossed. Queen faithful should definitely add this one to their coffee table book collection. An album full of pensive and spacious jams sure to please Wackerman fans. Chad Wackerman first made a name for himself as one of Frank Zappa’s key latter-year drummers, his cluster of booming toms a defining characteristic of Zappa’s ‘80s rock sound. Soon after joining Zappa’s band in 1981, Wackerman started jamming with Allan Holdsworth, later performing on many of the trailblazing guitarist’s classic albums. Dreams, Nightmares and Improvisations, Wackerman’s latest solo release with Holdsworth and veteran band mates Jim Cox (keyboards) and Jimmy Johnson (bass), is an occasionally engaging collection of pensive and spacious jams—perhaps too esoteric in its atmospherics to be a proper introduction for new fans (with the exception of more immediate tracks like “A New Day” or the classically Holdsworthian “The Billows”), but guaranteed to envelop imaginative listeners in its haze. Although Wackerman’s reflexively complex yet musical drumming is too refined for my taste (especially on misplaced funk jams “Brain Funk” and “Two For Ya,” neither of which grooves like I‘d like) plenty of his ideas on Dreams are evocative, and there’s an obvious improvisational chemistry between him and the rest of the band, especially the interplay with Johnson on bass. Elsewhere, Holdsworth is Holdsworth, mimicking avant-garde sax by way of his famously fluid legato technique, especially on “Edith Street.” And, he even busts out the SynthAxe! The phrasing is of course deeply personal, though sometimes too obscure to entrance the rest of us who aren’t inside his head. Even Holdsworth’s warm, muffled distortion has an overly intimate quality to it. Dreams, Nightmares and Improvisations isn’t consistently compelling (the performances, for one, could’ve simmered with more quiet intensity) but it boasts more than several highlights sure to interest acolytes of Wackerman-Holdsworth, including “A New Day,” “The Fifth,” “The Billows,” “Monsieur Vintage,” and “A Spontaneous Story.” Drummers and guitar players in particular will find much to appreciate here. Fusion/metal trio with exceptional musicianship brought down by dull guitar riffs, flat performances, and a stale sense of humor. Morglbl guitarist Christophe Godin appeals to shredders who crave tricky leads executed with exacting precision—the kind of people for whom tastefulness and soul are not requirements but virtues of a great musician. Brutal Romance, the latest release from this French, instrumental fusion/metal trio, will no doubt earn the band a collective pat on the back from fans for merely attempting a balance between taste and technique. This doesn’t bode well for those of us who find Morglbl’s chops to be a bore, since Godin’s licks are insipid and his improvisations unimaginative. Better at bass lines than Godin is at riffs, Ivan Rougney is the true virtuoso of Morglbl, with skill reminiscent of fusion giant Jeff Berlin. Being a virtuoso, Rougney neatly runs the gamut on his instrument with slaps and pops, Jaco harmonics, and jazz chords accompanied by simultaneously-played bass lines. But the complexity of his playing tends to compromise the tunefulness of his melodies, which don’t always grab you as much as they should. Other than some deficits in the quality of the bass mix (some additional clarity and top EQ is called for), the engineering and production are of a professional caliber, with Godin’s array of carefully selected guitar tones sure to please connoisseurs, as well as dispel any doubts that shred guitar can’t sound good in a fusion framework. Ultimately, Morglbl’s biggest distinction in the world of fusion—apart from their technical merit —is their attempted use of humor, which on Brutal Romance includes whimsical circus tunes, Weather Report references, and sterile, detuned metal riffs that would make perfect exercises in a practice book for shredders. For a band allegedly influenced by Frank Zappa, they sure are short on wit. For us, the release is just too emotionless to be truly captivating, much like the pop band Toto was sometimes derided by critics for being too sterile sounding. Nothing on Brutal Romance really stands out (and the drumming isn’t quite on par with the guitar and bass performance), but we’re hopeful that on future releases, Morglbl can put some additional effort into the songwriting and feel rather than just rehashing flawlessly executed fusion lines.